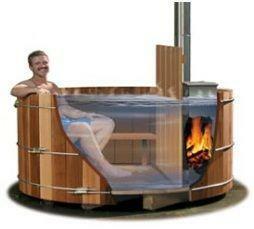 LorInternal Wood Fired Hot Tub Heaters have been used predominately with wood hot tubs to rapidly heat the water. However the same heater can be used to heat pools, swim spas and other acrylic and concrete style of hot tubs. An internal hot tub heater sits directly inside the pool or tub and as such 100% of the heat energy in the heater is transferred to the water. 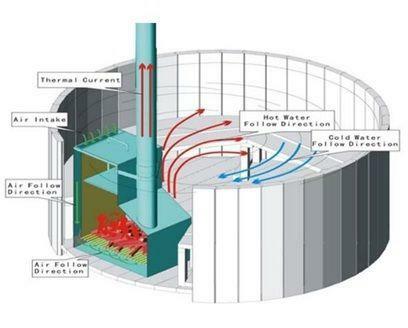 Similar to the external heater, the water around the heater develops a natural convection as the hot water is heated. Hot water is less dense and as such it will rise to the top of the tub and the cold water from the bottom will replace it and it too will then get heated. An internal pool or hot tub heater needs to mount to the side of the tub or fastened to the bottom of the tub as the internal air volume will cause the heater to rise (float). The fire wood is fed from the top of the heater and an air vent above the water line draws the air down into the fire chamber and then out through the chimney. The air flow is controlled by adjusting the air intake using the lid and the damper on the chimney. Because the hot water will layer to the top of the tub or pool, you will need to mix the water every so often to get an even temperature throughout the tub. An external pump can be used or a simple paddle is often used to mix the water.